Lush Fab Glam Inspired Lifestyle For The Modern Woman: Summer Entertaining In Red, White And Blue. Summer Entertaining In Red, White And Blue. Layla Grayce is celebrating this 4th of July with a bang! 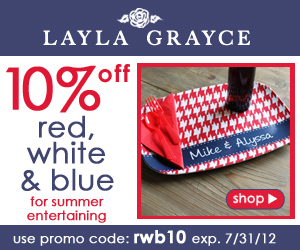 Enjoy 10% off red, white, and blue summer entertaining essentials with promo code rwb10. Below are some of my favorite items from the red, white and blue sale. Entertain in style with the Rosanna La Patisserie. 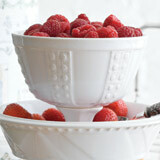 This tableware is perfect for parties because you can fill it with fruit, crackers, berries, etc. Are you attending a party this year? 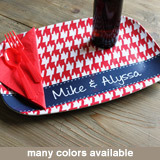 Be sure to bring along your Clairebella Personalized Melamine Platter. Not only can you use this as a tray but bring your dish on the platter and you definitely won't forget to bring it back home with you! 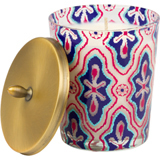 After all the 4th of July festivities have come to an end curl up with a book next to the Illume Boho Mediterranean Candle. Don't miss your chance to shop with Layla Grayce today. Enjoy!